The Nine Holy Martyrs of Kyzika: The city of Kyzika is located in Asia Minor at the coast of the Dardenelles (Hellespont) Straits. Christianity there began to spread about already during the time of the preaching of the Apostle Paul (Comm. 29 June). But under the times of persecutions by the pagans events came to this – that some of the Christians fled the city, while others kept their faith in Christ in secret. Therefore by the time of the end of the III Century Kyzika was still basically a pagan city, although there was also a Christian church there. The situation in the city distressed true Christians, who sought to uphold the Christian faith. From there were also the Nine holy Martyrs: Theognides, Ruphos, Antipater, Theostikhos, Artemon, Magnos, Theodotos, Thaumasios and Philemon. They hailed from various places, and were of different ages: both the young like Saint Antipater, and the very old like Saint Ruphos, and they came from various positions in society: among them were soldiers, countryfolk and city-people, and clergy. But all of them declared their faith in Christ and were all the more intense in their yearning for the spread and strengthening of the True Faith. Having shown up in the city of Kyzika, the saints boldly confessed Christ and fearlessly denounced the pagan impiety. They were arrested and brought to trial before the city governor. Over the course of several days they were tortured, locked up in prison and again led out from it, and promised their freedom for a renunciation of Christ. But the valiant martyrs of Christ continued to glorify the Name of Christ. All nine martyrs were beheaded by the sword (+ c. 284-292), and their bodies buried nearby the city. In the year 324, – when the Eastern half of the Roman empire came under the rule of Saint Constantine the Great (306-337, Comm. 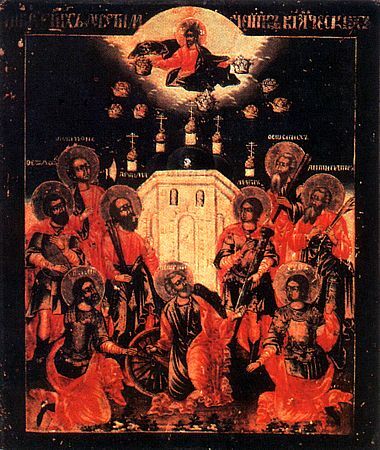 21 May), and the persecutions against Christians ended, the Kyzika Christians removed the undecayed bodies of the 9 martyrs from the ground and placed them in a church, built in their honour. Various miracles occurred from the holy relics: the sick were healed, and the mentally aberrant brought to their senses. The faith of Christ grew within the city through the intercession of the holy martyrs, and many of the pagans were converted to Christianity. When Julian the Apostate (361-363) came to rule, the pagans of Kyzika turned to him with a complaint against the Christians for the destruction of pagan temples. Julian gave orders to rebuild the pagan temples and to lock up in prison bishop Eleusios. Bishop Eleusios was set free after the death of Julian, and the light of the Christian faith shined anew through the assist of the holy martyrs. In Russia not far from the city of Kazan was built a monastery in honour of the Nine Martyrs of Kyzika. It was built by the monk-deacon Stefan, who brought with him from Palestine part of the relics of the saints. This monastery was built in the hope of deliverance through their intercession and prayers from various infirmities and ills, particularly the fever which raged through Kazan in the year 1687, "since, – writes Sainted Dimitrii of Rostov (+ 1709, Comm. 21 September), the compiler of the service to the 9 Martyrs, – by these saints was given abundant grace for the dispelling of feverish and trembling sicknesses". Saint Dimitrii likewise described the sufferings of the holy martyrs and compiled a sermon on the day of their memory.